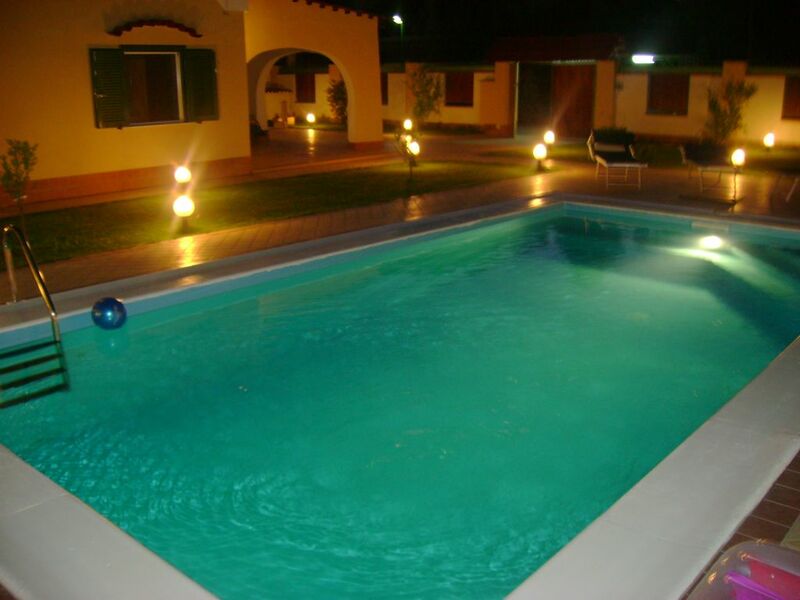 Beautiful Villa, with private pool, jacuzzi, Finnish sauna, garden. Villa SOLEIL is located on the ancient Via Appia, behind a beautiful and centuries-old pine forest that runs along the Tyrrhenian Sea, in the town of Castel Volturno (Caserta) Just 2 minutes from the beaches of the Domitian coast and a modern and elegant shopping center, 30 minutes from the most beautiful artistic, historical and archaeological sites of the city of Naples. The Villa SOLEIL is only 30 km from the Capodichino Airport (NA), just 30 km from the tourist port of Naples, where you can reach the beautiful islands of Ischia, Capri, Sorrento and Costiera in just 45 minutes by boat. Amalfitana, while by car the Sorrento and Amalfi coast are only about 1 hour 30 minutes from Villa SOLEIL, 50 minutes from the archaeological sites of Pompeii and Herculaneum, 35 minutes from the splendid Reggi of Caserta. Just 30 minutes you can admire the Veiled Christ of the Sansevero Chapel is one of the most fascinating and mysterious works you can see in Naples and Italy, 30 minutes from the PARMA SUBMERGED BY BAIA: Where the ancient Roman city of Baia once stood, in Bacoli, in the North of the Gulf of Naples, there is today a submerged archaeological site that you can visit, at 30 minutes is the National Museum of Capodimonte is a museum of Naples, located inside the eponymous palace, in the locality of Capodimonte: houses galleries of ancient art, one of contemporary art and a historic apartment, 20 minutes away The so-called Temple of Serapis is actually a Roman macellum, discovered in 1750 and today one of the best known archaeological monuments in the world. The SOLEIL villa is on one level and has 3 double bedrooms, one with two single beds, bright and spacious, 2 bathrooms, one with a bathtub and the other with a large shower, a lounge with a wood-burning fireplace. TV, bright and spacious kitchen, equipped with all comforts, including oven and microwave toaster and kettle, espresso coffee machine for waffles and cappuccino, TV with active SKY service, active Netflix, free Wi-Fi fiber internet service. The Villa SOLEIL has 600 meters of partly paved garden and equipped with an inground pool (8x4x2), private for the exclusive use of guests only with outdoor shower, 1 umbrella for pool with 4 sunbeds, 1 large garden umbrella with tables and chairs, 1 garden hammock, outdoor hot tub for 4/5 people, gazebo in the garden with Finnish sauna for 4 people, 4 mountain bikes with helmets and parking space. Comfortable outdoor covered patio with attic fan for quiet candlelit dinners and fantastic lunches enjoying the pool and garden views. It had everything one needs to have an excellent holiday, the ONLY exception being no dishwasher. Dear Guest, we thank you and we are happy that you have enjoyed the Villa Soleil. Very friendly and attentive guests. Greetings Valeria and Salvatore. We met Valeria and Salvatore at the villa on arrival, they were very friendly and welcoming. Nothing was too much trouble for them, they were very helpful and accommodating with any questions or requests we had. They left us a very generous welcoming package for our stay which was excellent as we did not have to rush to the supermarket straight away. They also provided many leaflets for tourist attractions and places of interest. This villa is a great spot for staying in if you want to travel to see Pompeii, Naples city centre. Mt. Vesuvius, Amalfi coast and Sorrento to name a few.. The villa was beautiful and felt like a home away from home with all the amenities of your own home. We enjoyed our stay very much and we would highly recommend staying at Villa Soleil. Thank you Valeria and Salvatore for giving us a wonderful holiday. Thanks dear Colette, wonderful woman with your family. You treated the Soleil villa as if it had been your home leaving it clean and tidy. I am happy that you have found yourself well and I wish you and your family a wonderful summer ........ Greetings Valeria and Salvatore. Great Property with the most amazing hosts!! What a great villa and pool. Valeria and Salvatore could not have been more welcoming, They met us at the villa and talked us through everything, they can't do enough for you, absolutely brilliant. A fantastic welcome pack awaited us, so don't go shopping till you see what they leave you!! The local area is not so good and was a disappointment, but this is nothing to do with the owners and they certainly make up for it with their lovely villa. I think that is why the villa is such great value for money. As long as you see past the area, then this is a lovely home from home with the added bonus of sunshine and a pool. We found a couple of great restaurants in the area, hired a car for a couple of days and had a great time. Thank you Valeria and Salvatore - we loved your house. Hello dear Richard, I am moved and happy for your kind words. I'm glad you enjoyed and relaxed. You are special people and you made us feel like your friends. See you soon, I wish you all the best. they can't do enough for you, absolutely delightful. A fantastic welcome pack awaited us, which was so nice on the first day of our holiday. We used the villa as a base for Pompeii, Vesuvius and Sorrento and the Amalfi Coast. The first two are about 1 hour drive away (Amalfi about two) so easily reachable. The local area is not so great to be fair, which was a disappointment, but I think that is why the villa is so amazing for the price. As long as you are not too worried about that, then this is a perfect lovely 'home' for families visiting the region. Thank you Valeria and Massimo for a lovely holiday chez-vous! . Hello Christopher I'm very happy to have had you as a guest in my villa to you and your wonderful family. I'm glad you were fine. I salute you and wish you happy holidays again. Das Haus ist geräumig uns sehr gepflegt wie die gesamte Anlage, die wirklich alles beinhaltet, was das Herz begehrt. Es war auch tatsächlich alles, wie angegeben und unsere Erwartungen wurde von Valeria und Salvatore übertroffen, die einzigartige Gastgeber sind. Super freundlich und zuvorkommend und uns erwartete ein Willkommenspaket, das mit so viel Liebe zusammen gestellt war. Danke an Euch für alles! Vor allem für uns war es eine wahre Freude und Ehre, eine schöne Familie wie die Ihre zu beherbergen. Und wir freuen uns sehr, dass es Ihnen gefallen hat. Wir wünschen Ihnen das Beste für Sie. Wir waren im Oktober 2018 für zwei Wochen dort und wir haben uns in der Villa wirklich wohl gefühlt. Valeria und Salvatore, die beiden super netten Vermieter, haben sich um den Flughafentransfer gekümmert und als wir ankamen, war der Kühlschrank gefüllt mit allerlei Leckereien aus der Region. Das war ein schönes und herzliches Willkommen durch die beiden! Im Haus war alles bestens. Alles Nötige ist vorhanden. Pool und Whirlpool sind gepflegt und für die Kinder waren viele Spiele vorhanden. Nach einer Woche Reinigung und Wäschewechsel. Weiterer Pluspunkt ist unbegrenztes W-Lan. Die Villa liegt am Ende einer geschlossenen Straße und es ist sehr ruhig. Mit dem Auto in die Stadt dauerte ca. 30 Minuten. Parken in Neapel ist aber sehr teuer. Viele schöne Ausflugsziele rund herum, aber man sollte schon ein Auto haben. Man kann sich bei schönem Wetter aber auch im Garten gut erholen. Wir haben unsere Zeit genossen und danken Valeria und Salvatore für die freundliche und herzliche Aufnahme. Lieber Jürgen, mein Mann und ich haben uns gefreut, eure familienfreundlichen Menschen begrüßen zu dürfen, die so nett und freundlich sind, besonders der große Jürgen, eine wahre Kraft des Lebens. Wir umarmen dich liebevoll, Grüße an die Kinder. The Villa SOLEIL is located in a private avenue and closed by an electronic gate where only residents can access, and is only 5 minutes from the countless beaches with well-equipped bathing establishments of the Domitian coast. From the Villa SOleil you can easily reach the historical and cultural center of Naples in just 25 minutes by car. The historic and beautiful Medieval Gaeta 50 minutes by car. The beautiful beach of Sperlonga is a 50-minute drive away. It is also just a 3-minute drive from a shopping center for your daily purchases. The tourist port of Naples is only 30 minutes away where you can reach the islands of Capri, Ischia and Procida and Sorrento by fast hydrofoils in 45 minutes. The beautiful Amalfi coast with Positano, Ravello, Maiori and Sorrento just 60/70 minutes by car. The Archaeological excavations of Pompeii and Herculaneum are 60 minutes away by car. The Royal Palace of Caserta is only 30 minutes away by car. And many other enchanted and wonderful places not far from Villa SOLEIL.